Some days the market offers complete rubbish. 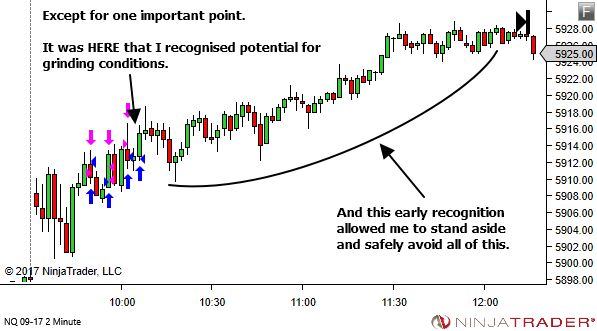 So far we mentioned the following price action clues which helped form my decision to stand aside and watch and wait for better conditions. "Feel" – The price movement itself intra-candle just "feels" slow and sluggish. And while it's present through all price movement, it's particularly felt when sitting in a position and it's just NOT moving the way you like. It's a factor which gradually became clear between 5 and 30 minutes after the session open. So let's get to the whole point of my article and check this out. We'll begin by looking at the DAILY chart. But it was a long time since we've seen the daily volume so low. And low volume is often (not always) an indication of a dull, lifeless session. Just the kind of session I prefer to avoid. 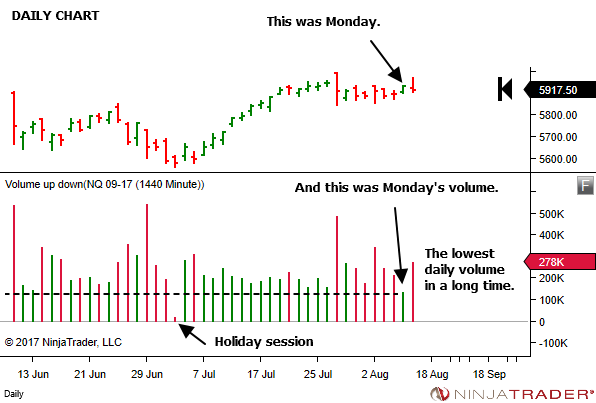 Of course, the exchange does not publish the end-of-day volume before the session starts. 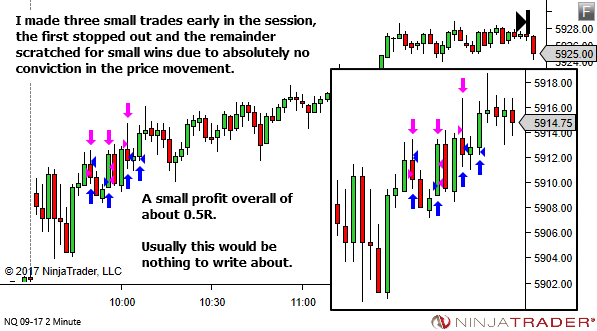 The opening 30 minute volume gives a clue as to the kind of day we'll get. A very low opening 30 minute volume suggests low participation and (in the absence of any reason for this to change) a higher likelihood of a lower volume day. In other words, if the 30 minute volume is really low, expect dull, lifeless conditions ahead. 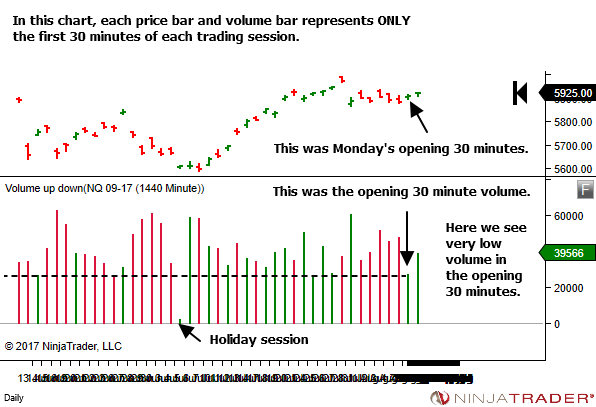 So here's the opening 30 minute volume. Again, very low compared with recent historical averages. And rather than wait till 30 minutes, we can take a quick peek at 5 and 15 minutes into the session. 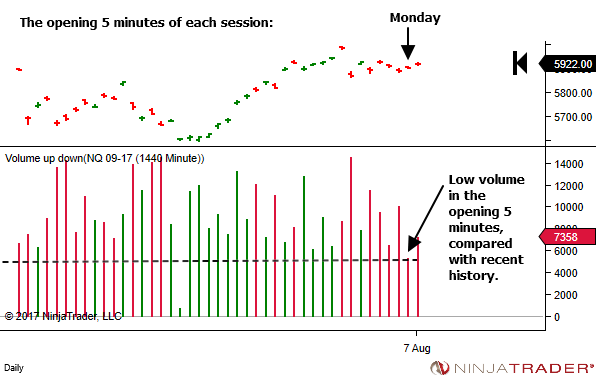 There is no need to build and display these chart templates which show only the first 5, 15 and 30 minutes of data. Just glance at the volume after 5, 15 and 30 minutes and you'll get a feel for whether it's low, about average or high. 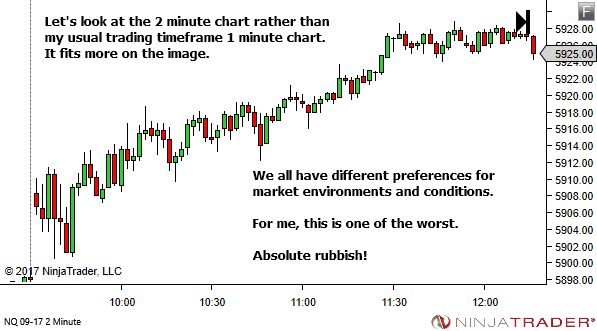 A low opening five minute volume is a warning sign. Participation is low. Interesting! Take note. If it continues after 15 minutes, this is a bigger warning sign. Take care in these markets. 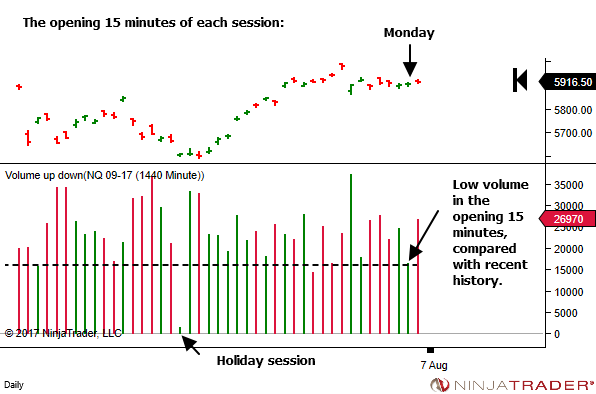 And if the volume remains low at the 30 minute mark, when compared with historical averages, expect a potentially dull and lifeless session. At least until something shocks the market out of it's slumber and shifts the sentiment of the market participants. Sometimes it feels good to take hold of your small profits and call it a day. There is a life to be lived out there, away from the charts. On this particular Monday, the volume was low after 5 minutes. And again at the 15 minute mark. 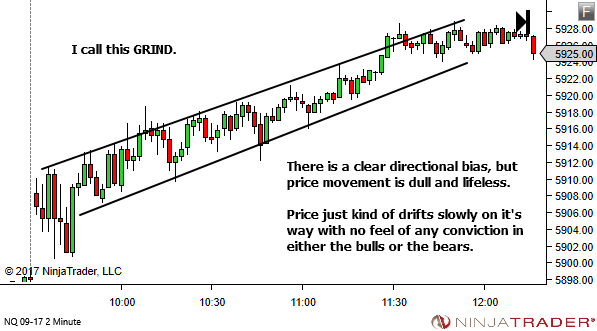 Price action had felt slow and sluggish. In particular when in a trade. Price structure had the appearance of potential grind – one of my least favourite trading environments. And then at the 30 minute mark, volume was clearly the lowest for at least the last few months. There was no need to trade any further. Tomorrow will be a whole new day and a chance for much more favourable trading conditions. It’s good to know that others find the grind is a bit much. With spot FX, there’s no volume. My trick is to start a timer (2 minutes) and count the number of trades (the prices flash whenever a trade hits). Less than 50 and I go for coffee. Are there any such keys inside the session? 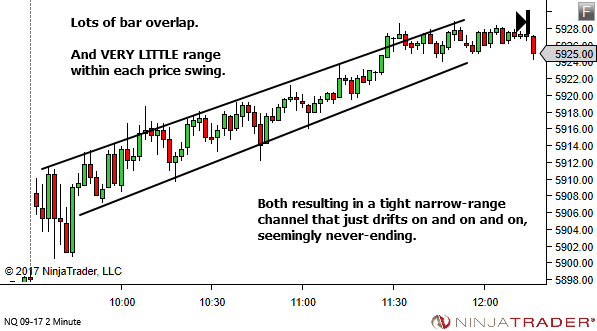 When does the Price Action go into a sluggish, lifeless state? Yes. A big part of the decision is that the price movement itself intra-candle just “feels” slow and sluggish. 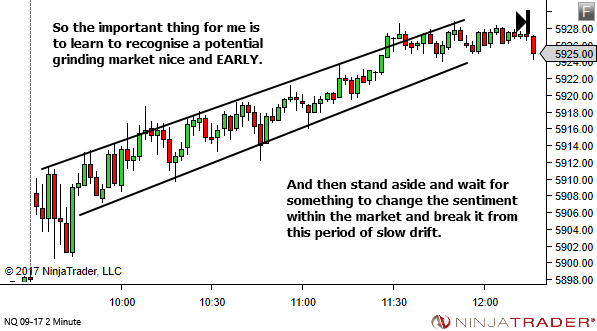 If you’re experienced in a particular market you’ll get to know the typical pace and feel of price movement. This was slow. 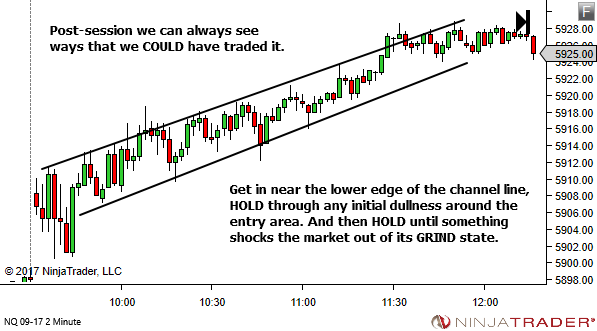 Plus the bars themselves show little directional conviction. Typically small in range with much overlap.